Eoghan Rua showed the resolve of champions as they retained their All-Ireland intermediate club camogie title in an incident-packed final at Croke Park. The Derry girls were extremely fortunate to be still in the game at half time, having been outplayed for the majority of proceeding at that stage. Goals from Jane Carey and Gráinne McGoldrick proved significant however, as they remained in touch at the interval, trailing by 0-9 to 2-0. Manager, Joe Passmore clearly earned his corn at half time and his charges were a completely different proposition after the resumption, as they dominated the middle third having been over-run in that sector in the opening period. With Gráinne McGoldrick playing plenty of ball and proving deadly accurate from placed efforts, and Megan Kerr benefiting from an increased supply, Eoghan Rua gradually got themselves in front and were deserved victors in the end. Ardrahan will be devastated though, as that three-point interval lead was such a scant indicator of their superiority in the first half. Brenda Kerins was on fire for the Galwegians, weighing in with three points from play. Her influence was curbed somewhat after Eoghan Rua captain, Méabh McGoldrick was given the marking duties, but that robbed the Ulster crew of a pivotal presence at centre-back. 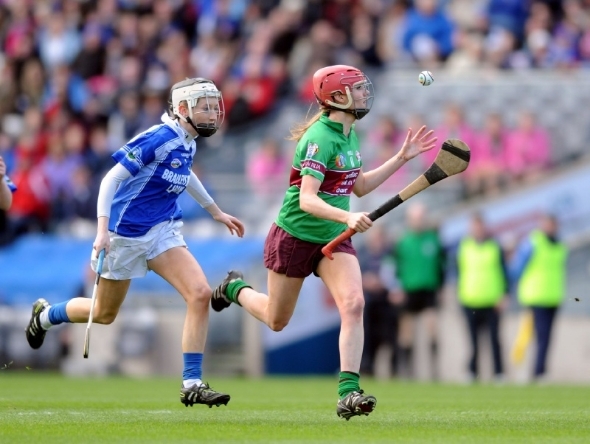 Aoife Callanan was outstanding too, contributing four points and winning mountains of possession but with the 15th and 17th minute strikes by Carey and Gráinne McGoldrick, the game was still a contest when Ardrahan should really have been out of sight. Crucially, Jane Carey, Kelly Maybin and Maeve Dillon helped effect a massive turnaround at midfield in the second half and their forwards responded to the increase in supply impressively. That also enabled Méabh McGoldrick to return to centre-back and Kerins, starved of any ball, was eventually forced to follow her. It was Gráinne McGoldrick who was the star though, shooting six second half points, while Kerr added a brace after showing good pace and elusiveness. And yet Ardrahan might have snatched it, but goalkeeper Sara Skehill, who had goaled from a penalty in the semi-final, could only manage one point from two similar opportunities in the final six minutes. Fittingly it was Gráinne McGoldrick who saved the second penalty and cleared. Callanan did reduce the margin to two points with a late free but Eoghan Rua held on to make it two-in-row.